Las Vegas is so much more than just casinos and nightclubs. To quench your craving for a little outdoor excitement, embark on a 20- to 50-mile guided 4WD ride across Nevada's scraggy desert terrain. 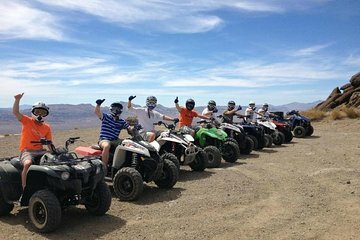 Set out on often challenging off-road paths, savoring the scenery of the Hidden Valley, Mojave Desert and Primm Valley, as well as spectacular views from mountain overlooks en route. 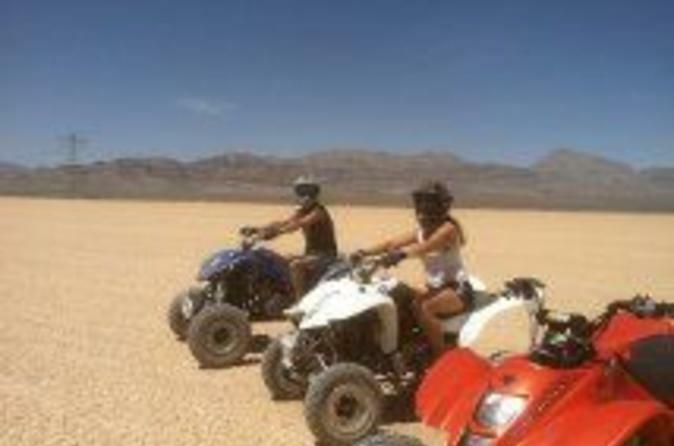 Billed as Las Vegas's longest ATV tour, this extreme adventure is a must for thrill-seekers. trip was amazing and the view wqs incedible. Take out 1 star for mechanicak issues. I highly recommend this tour! Our guide was Anthony, he was nice and took an interest in making sure we had a good ride. From screaming across the dry lake bed to the fast track over very moguled paths--this was truly extreme and equally enjoyable! We would do this again in a heatbeat. My girlfriend's legs were sore for 4 days afterward! It was a fantastic experience. The only thing that would have made it better is if it was longer. Great fun, yes it was hot, yes it was dusty, The staff is great the machines were excellent the terrain was better than anticipated. Highly recommended. Best fun I've had in years - really enjoyed it. We took the extreme ATV adventure and I must say the staff were very helpful with making me feel confident about riding. The trails were a lot of fun with twists and turns. We got to see some wildlife up in the hills and it even snowed. It was really beautiful, you would never think that you were still in Las Vegas. I would definitely recommend this tour to anyone even for the whole family as it was awesome.